MANDEM (MFA art student Maize Arendsee) has work appearing in the _Feminist Iconography_ exhibit at the UWF Center for Fine and Performing Arts (Pensacola, FL) from November 11-15. MANDEM also has work at the Alexandria Museum of Art (Alexandria, LA) through November 22 and the Gadsden Arts Center (Quincy, FL) through December 23. As the UWF Women’s Studies Collective’s first-ever art exhibition, _Feminist Iconography_ showcases student works that contemplate female histories and the ways in which women have spearheaded various social and cultural revolutions. The exhibition will be hosted in TAG (The Art Gallery) from November 11-15, with a reception on November 13 from 5:30-7:00pm at TAG. The exhibition and reception are free and open to the general public. 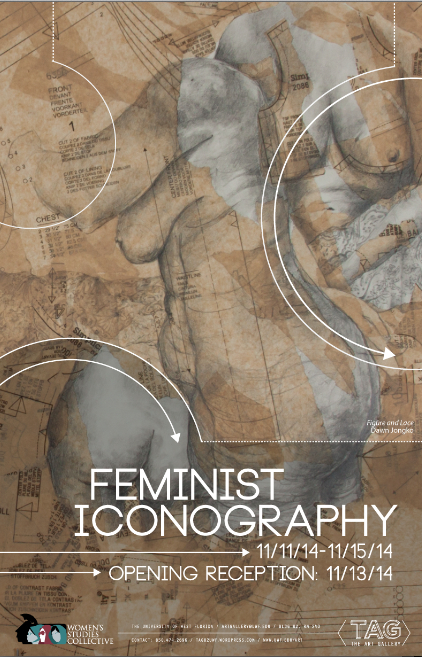 For more information about _Feminist Iconography_ please contact Becca Namniek or Taylor Willbanks at uwffeministtheory@gmail.com or Nicholas Croghan, Art Gallery Director at ncroghan@uwf.edu.